A screenshot from Facebook’s ad portal. A coalition of civil rights groups filed suit against Facebook on Monday, alleging the already harried company violated the Fair Housing Act by allowing housing advertisers to discriminate against minority users. The National Fair Housing Alliance, Fair Housing Justice Center, Housing Opportunities Project for Excellence, and the Fair Housing Council of Greater San Antonio filed a joint suit asking a judge to declare Facebook’s policies as discriminatory and require the company to change its advertising policies to prevent discrimination. Central to the lawsuit is how Facebook synthesizes the behavioral data it collects from users. In 2016, a Pro Publica report found that Facebook allowed housing advertisers to target, and exclude, categories of users based on their interests. Advertisers could create housing ads, then choose to include or exclude the ad from being shown to users who had indicated certain interests. The first part of the suit alleges that these interests acted as proxies for minorities, violating the Fair Housing Act. The suit filed Tuesday covers both proxy exclusions as well as more direct exclusions. After a November 2017 follow up from Pro Publica found Facebook still permitted many of the contested advertising practices, the NFHA created fake ads to see if Facebook would accept them. It did. Among the categories Facebook allowed advertisers to exclude were “parents with toddlers” and “parents with preschoolers.” As the NFHA found, with a few clicks, advertisers could show ads to “men” with “no children” and exclude varying parent-based categories like “soccer moms,” “parents with grade school kids,” etc., creating housing ads that went out to single men to the exclusion of women with children. The groups allege this violates both the Fair Housing Act and Facebook’s own internal policies on discriminatory housing ads. Facebook revised these rules in late-2016 after Pro Publica’s first report and again in 2017 after the follow-up. The complaint alleges that not only has Facebook been lax in implementing the changes it promised in its apologies, but that Facebook may be using algorithms to secretly continue abetting illegal discrimination. Just last week, when preparing the complaint, the NFHA tried to edit fake ads it’d created in 2016 to test the ad portal. According to NFHA, a pop-up appeared, saying: “some of the detailed targeting selections you originally used in your Saved Audience are no longer available. They won’t show up in this audience targeting, but the associated ads will still deliver to the original audience. 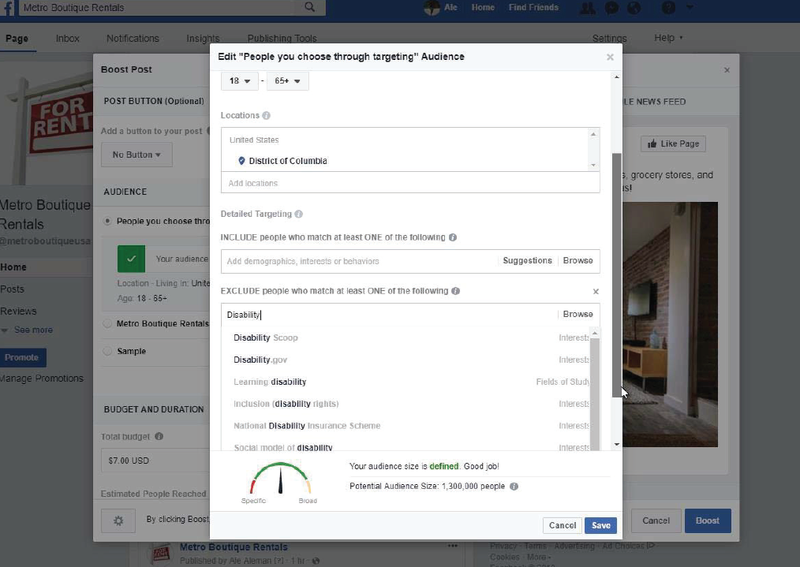 However, you’ll be unable to use these detailed targeting selections if you edit this audience or try running future ads with it.” This could potentially mean the discrimination continues. Ultimately, the groups want Facebook to remove the selection categories that are tied to protected demographics, either by proxy (race, national origin, disability) or directly (gender, family status.) The unanswered question of editing old ads brings new complications, as Facebook could potentially continue discriminatory practices even after removing the problematic categories from the ad portal. “They’ve eliminated the checkbox, but I don’t think they’ve eliminated the algorithm,” Berman said.